I used to live in New York City. My first child was born there, I have good friends there, and I still have fond feelings for the city. Public transportation! Restaurants! The Natural History museum! The Unisphere! Pan de yuca! Until I see a listing like this one that Jax found... and suddenly, my bland suburban neighborhood seems just dandy. Since it's craigslist and the ad will disappear soon, I'm going to copy and paste the excellent description: "Room Available November 1st. Room is approx. 10x8 (no windows). Room has private bathroom. There is no separation between bathroom and bedroom. Room is in basement. Private, no roommates. No kitchen access but you do have a mini fridge and microwave. Utilities are included. Located less than one block from L train, Bedford Ave and B61 bus. Please email some info about yourself along with how long you are looking to sublet for. (Optional semi-furnished)." "North 7th street at Bedford Ave" $550. I suppose I'm cheating by having the photo here -- it's not like there's a better photo they could've taken. Great for when you come home totally drunk! You can pass out in your bathroom and not lie to your mom when you say you slept in your own bed. 10x8 appartment. 9x9 prison cell. I get 1 more square foot of space in Angola State Prison and free meals to boot. If my life came to living here, I'd rob up a bank, sit at the curb with the bag of cash, and lie down quietly when the police showed up. Think of all of the gourmet meals you could whip up in a place with a microwave and a mini-fridge! I know NYC is very expensive, but surely one could find a better room for $550/mo. It looks like the hole that Saddam was hanging out in before they captured him. That "room" is $550 a month???????? OMG! My mortgage including taxes and insurance for a 2600 sf, 5 year old house on 1/2 acre in Idaho is $920!!!! I don't get New York. Give me clean air and lower living costs any day. 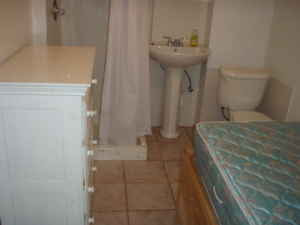 $550.00 per month for a bathroom with a bed? OMG! I knew NY was overpriced, but pahleez!!! Get rid of the bulky, waste-of-space dresser, and you could consider having some people over for a party! no window, isn't this illegal for safety and fire reasons? all that for $550, what a deal. Looks SO familiar- I used to live in the city! But surely some stuff from IKEA will bring it to life!! He's got a set of cajones on him renting out an extra bathroom as an apartment! Damn, that's nuts. Even for NYC. This is not uncommon- and to be honest, this is the future of American city living. Japan has dwellings even more sparse than this. For people who live their lives out at work, then in the getamono and karaoke bars in the evening- well, here you go. You will see more and more of this in New York and elsewhere. I think I'm jaded because my only deterrent was that it was one of those European showers where the shower curtain sticks to you the entire time and you always end up getting water all over the floor. Since the bathroom floor is also your bedroom/kitchen floor, that could be bad news bears. Seriously - $550 a month!?! Even the teeniest tinest cabin on a cruise ship is bigger than this. In fact this is like living in the bathroom on a cruise ship where you can use the toilet and take a shower all at the same time. I do live in NYC and I can tell you that no, you cannot find a better room (with your own bath!) for $550. The average bedroom in a shared house in this neighborhood is $900. It's in the heart of Williamsburg, Brooklyn, a hipster paradise, so you get the added bonus of artsy people in skinny jeans with ironic mustaches. Well worth it! How do you know you lived in Calgary for too long? When you look at a listing like that and think "that's pretty reasonable". After all, he's not paying $750 a month *and* sharing the bathroom with 21 other guys. I have to wonder about the optional semi-furnished. Is that the mattress? Well call me a blonde Aussie but I'd pay $550 for that place just to live in NYC for a while. You know Casey Anthony (Nancy Grace item) has just as much space in her Orlando cell. I think jail might be better because they bring to your room, ahem! I mean jail cell 3 meals a day. Here you have to find space for that mini-frige and micro. Where would they go? On top of the toilet? Then you can use the facilities while popping popcorn! That's novel. All your dishwashing in the shower! Brush your teeth in bed. The potty does double duty as a chair--just add a fuzzy cover. Where is Dwell when you need them? I'm back to add that the listing has been flagged for removal. Well, not only is that "landlord" insane but he obvioulsy doesn't appreciate promotion of his "rental property". I'll just have to start to look for some good pictures from Finland to send to you. Okay, people... does anyone commenting here actually know NYC? Show me ANY other way to live without roommates for as low as 550/mo including utilities in prime Williamsburg (first L stop). Living here is about making tradeoffs. I would visit this place if it had a window (but in that case it would be like 700/mo :)). I've seen much crazier listings on craigslist. OK, I've lived in NYC for 11 years, and although I know that may be the best you can scrounge up (rolls eyes) in Williamsburg, I think the point here is why would someone succumb to such circumstances?? It may be reasonable for an overhyped neighborhood (which only 10 years ago was diverse, quiet and affordable), but it's not reasonable in any other way. I've met loads of people who've made their living off of ripping off subletters. I doubt this one was really hurting for the extra $550. Never again do I complain that my three bedroom ranch style is too small. But this gives me an idea...I think we could fit a twin sized mattress in our master bath...maybe we could sub-let it. It has a sky light...maybe $600 a month. You're paying to be with the Willamsburg hipsters. If you gave a crap about money you'd move to Queens and have a real room with a window. This would also be great for those times when you feel kind of ill, and you feel you want to lie down, but you're afraid that if you get in bed you might not be able to make it to the bathroom in time. Umm, except for the fact that unless this room has EXCELLENT ventilation, you might have to go somewhere else for a bit afterwards. Sadly I could probably stop 20 people on the street on my walk home who would go for this. BEDFORD L STOP OMG! You have to give up your personal space for hipster status, duh. OH THE MEMORIES! I lived in a 10x10 room on the Upper West Side right near central park. It had only a mini fridge and microwave too, but the bathroom was shared and down the hall. It had a window though! Rent? $1095!